Obtenez un vrai goût du Brésil au cours de cette visite culinaire de 3 heures avec un guide local. Promenez-vous dans les marchés animés de São Paulo, y compris un marché local typique et le légendaire marché municipal de São Paulo. Découvrez les plats traditionnels brésiliens et leurs secrets auprès de votre guide local en vous promenant dans les étals remplis de produits colorés et parfumés. Dirigez-vous vers le salon gastronomique du marché pour déguster des plats savoureux, notamment la lanche de mortadela (sandwich de Bologne), et découvrez les ingrédients utilisés pour la préparation de la feijoada. Découvrez les produits colorés et parfumés du Brésil présentés devant vous pendant que vous vous promenez dans les étals du marché. Our guide Doris was wonderful. Not only did we learn about foods of Brazil, but she was wonderfully knowledgeable about the history of Sao Paulo. And you cannot beat a hot fresh Pão de Queijo! My wife and I have enjoyed food gastronomy tours all over the world for years. This tour is NOT a food tour, in spite of the description. It is a guided tour, and in my case she was a very nice lady who was born and raised in Sao Paulo who did not know all that much about food. She knew a lot about the history of the city, but I didn't sign up for a historical or museum tour which she also does I signed up for a food/gastronomy tour. I was in Minas for the week prior on business, and had one day in Sao Paulo by myself before returning home. I was picked up at my hotel in Jardin district and we drove quite a ways to the market. When we walked in we just began walking up and down the aisles and she would point out some things as we went and we randomly stopped at a couple of stalls to ask for a sample of fruit or cured meat or something - some even had little plates with samples to give away. It became clear that each person was asking us if we wanted to buy the item after sampling - and my guide said she usually mixes up her sample stops so the vendors don't get mad. In my prior experience, the tour company has already arranged with certain vendors to provide tastings and the stop is never a surprise and they usually are glad to provide a little background on their products. I was appalled to realize that I'm on a private and very expensive tour, and this was how it was organized. We made our way over to a shop that sold the famous mortadella sandwiches and pastels empanada like pastries which she said was what SP was known for and that we must try them, but upon ordering there was a very awkward moment when I was asked to pay for them. I had already paid 195 USD for this 3 hour food tour - and now I was being asked to pay for the food, as well. I was shocked and I politely let my guide know that on the spot and she was empathetic but said it was covered on the tour description. She did pay for it because their credit card machine was working but I made up for the cost in my tip at the end. Upon looking, I found that is does say you pay for food on a second tab with additional information but not on the Overview tab that is visible when landing on the tour page. Even so, and again based on prior experience, I would have thought that to mean you pay for any purchased food as in full items and that tastings/samplings of small portions would have been part of the tour. This already was the most expensive tour hourly rate I've ever booked. We just did an all day 7 hour cooking class in Mexico City that included all food, several appetizers, main course and dessert plus cocktails and it was only 175 USD per person - essentially for an ALL DAY cooking class in a beautiful home, with staff to help prep, and with 2 hours shopping in the market. We did an all day cooking class in Cortona, Italy Tuscany that included two meals - lunch and dinner - and lasted 11 hours which included shopping in the markets, the cost of all food and wine ample amounts of each and that was just 200 per person. We also did a 4 hour tour in Florence that included entrance to the Academia museum and 45 minute walkthrough and explanation of David statue by Michelangelo as well as 5 different food stops with sample portions plus extras if desired, including a full lunch, and a private guide for 125 per person. I don't think cost of living is higher in Brazil/Sao Paulo than in Italy/Florence/Tuscany. 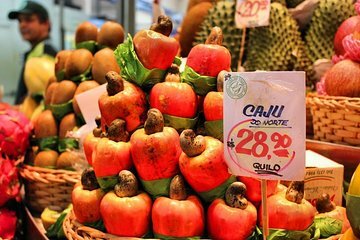 I was very reluctant of the cost of this tour but really wanted to see Sao Paulo through the lens of its food - just like we've come to enjoy in so many other cities. But, this was the only food tour I found on Trip Advisor and it only had one brief review...I finally broke down and booked it. Look at the number and content of my reviews. I have a lot of them and I'm always fair and rarely have a negative thing to say about tours but I feel completely duped by this one. My guide was a wonderful lady and I don't think it's her fault that the tour company projected something that she couldn't deliver. She did drive me around my hotel neighborhood, just as the other reviewer stated, and was good about providing some context of the area. Sadly, that is not what I was hoping for when I paid the 195 fee. This tour company is incompetent, in my opinion, to be offering food tours and if that is what you are seeking then BE WARNED you will not receive anything of the sort. This is a very shallow walkthrough of a large farmers market with some random tastings, and historical context/info. So, ultimately, maybe it's just simply my fault for having a different expectation, but having done many of these in cities worldwide, I have NEVER had something be so far off from expectations. The one review wasn't really enough to be informed so going forward, hopefully anyone considering this tour will have the benefit of my review to provide a more in depth picture of what to expect. I not only got some amazing tastings, but I was driven through an area near my hotel. The neighborhood was full of shops, cafes, and restaurants, which were easily accessible to my hotel. This certainly personalized my tour, and was meant to make the rest of my stay in Sao Paulo enjoyable.